All over the world, women's rights are constantly flouted. From forced marriages to honor killings to genital mutilations, not to mention repudiations plunging millions of women and children into destitution, harassment of pregnant workers in Japan, and lack of sanitation facilities in Africa Sub-Saharan Africa, hindering the enrollment of thousands of girls and causing even more deaths every year, it is clear that the injustices seemingly arising from another time continue. 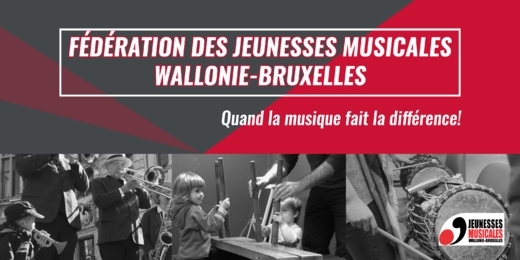 In this season 2017-2018, the Jeunesses Musicales Wallonie-Bruxelles have chosen, through an abundant program of artists and works of yesterday and today, from here and elsewhere, to highlight women in their riches, their diversities, their complexities, their creativity, while evidently surrounding them with men, ambassadors of their freedom of speech. In this context, we are honored to welcome Paradise Sorouri, one of the first Afghan rappers dedicated to the awakening of consciences in her country. The very talented Akhtamar classical quartet, exclusively feminine, dealing with popular Armenian plays, and Kaliště recalling the life of composer Clara Schumann alongside her husband Robert and his accomplice Johannes Brahms, singers of "Sisters in Crime", immersing ourselves in the America of Bernstein, Gershwin and Porter, the duo of electro-pop charm Faon Faon in mood and freshness, the trio of Polish singers-instrumentalists Sutari questioning with a subtle humor the roles traditionally reserved for women, but also the Nina Simone Wild as the Wind project, paying tribute to this artist and his commitment, Recital Boxon, to the writing denouncing current societal drifts, and Lucy Nemorosa inspired by the Mother of the Mothers, that of the dawn of humanity. And Art, in front of this situation, can do much. If music does not always temper manners, at least it has the power to deliver a word, a message, a meaning, each time singular and touching, nevertheless, to the universal consciousness because transcending the linguistic, semantic and philosophical borders.